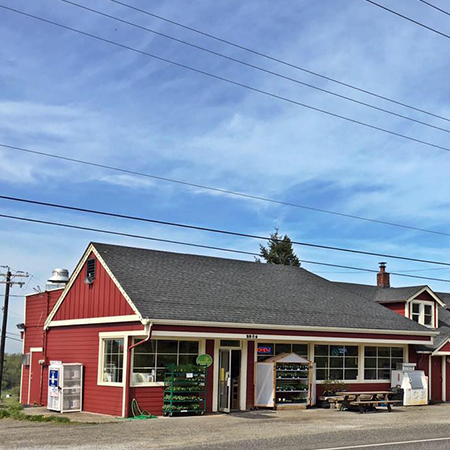 The Rome Store, on Mount Baker Highway, is more than a hundred years old. In 1915 the store was moved, atop giant rolling logs, from Goshen to its current location. It’s easy to imagine it as a bustling community hub, before Mount Baker Highway was paved, with all kinds of homestead staples. Over the years it’s changed shape and form, but in the last six it’s experienced a revitalization like it hasn’t seen in a long time. 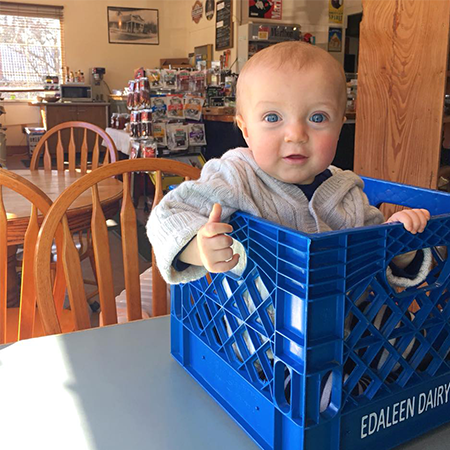 Noah and Megan Westgate, along with their children (the cutest you have ever seen) bought the store in 2013 and began a long labor of love. 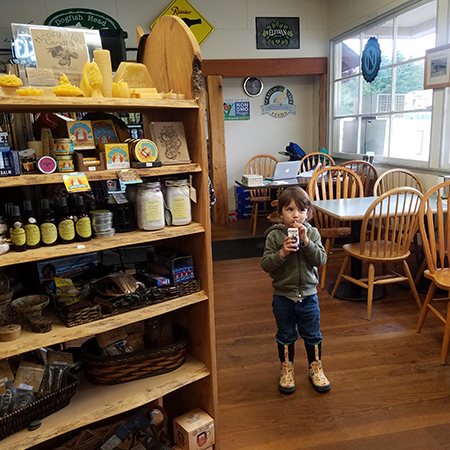 Everyone in the family buzzes with a special kind of energy, especially their oldest Robin, who proclaims that organic grape juice boxes are his favorite treat in the store and the Scratch and Peck “beds” his most favorite place. But long before the kids, Noah and Megan both attended college in Claremont, CA. Megan studied art and dance at Scripps College and Noah studied geology at Pomona. They share a passion for food and health and grew up in similar communities – though states apart. 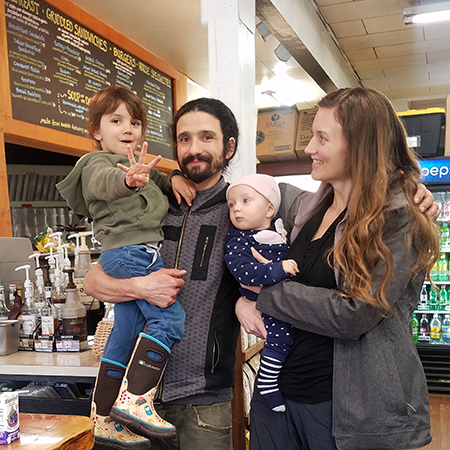 Megan was raised in rural Massachusetts and Noah grew up in Whatcom County, just down the road from Cloud Mountain Farm where his first job was pruning fruit trees for Tom Thornton. At the time he left for college he swore he would never touch another shovel again – but that didn’t go exactly as planned. He laughs when he says girls are what lured him back into farming again, but it is what brought him and Megan together! They met at “The Gorilla Farm Club”, an organic permaculture farm that Noah helped start on an abandoned corner of the Pomona campus, much to the chagrin of college administrators. Once they learned that a full orchard had already been planted they begrudgingly changed the campus long-term growth plan and incorporated the farm, which is now one of the main highlights of campus! Megan is no stranger to trailblazing either, and shortly after college founded the Non-GMO Project, a non-profit organization whose little orange butterfly verification mark is now on more than 50,000 products throughout the U.S. and Canada. 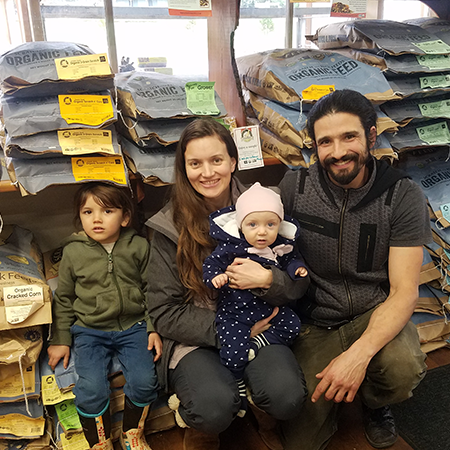 Now Megan and Noah own their own small homestead just down the road from the store and have integrated bits and pieces of themselves and what they’re passionate about to create one of the most beautiful iterations of the Rome Store. 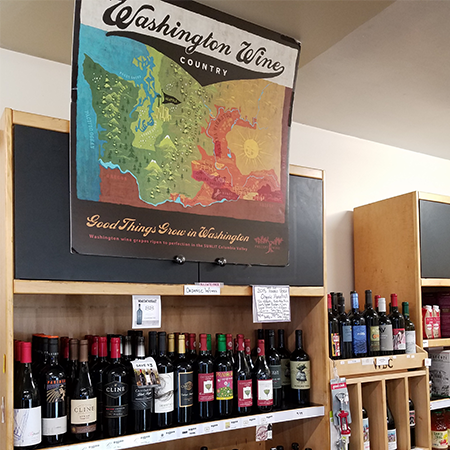 It still offers all the traditional goodies a corner store usually has, but now also kitchen staples from organic companies; fresh produce (locally sourced during the growing season); and a kitchen with fresh, local, and affordable hot meals. 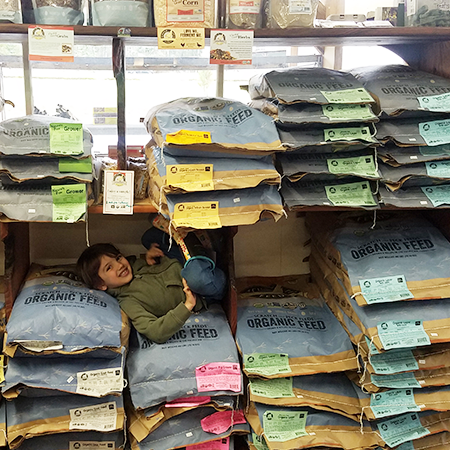 They’ve even built a special relationship with Scratch & Peck Feeds and sell their chicken, duck, and goat feed in the shop, much to the delight of many customers. New floors, new kitchen, and new products make for an open and inviting corner grocery spot. A few dining tables and picnic tables in the summer provide space to enjoy what could potentially be the best and most affordable grass-fed burger. The kitchen expansion was phase two of the Rome remodel. They offer whole foods and hot meals, ready to go or ones you can sit down to and enjoy. Breakfast sandwiches with organic and cage-free eggs. Griddled sandwiches, bone broth soups, mac & cheese, and more. 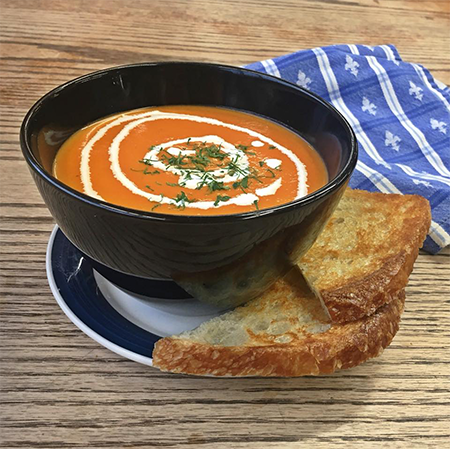 The promise they make to their customer is that their food is wholesome, fresh, delicious and made from scratch using lots of certified organic ingredients. 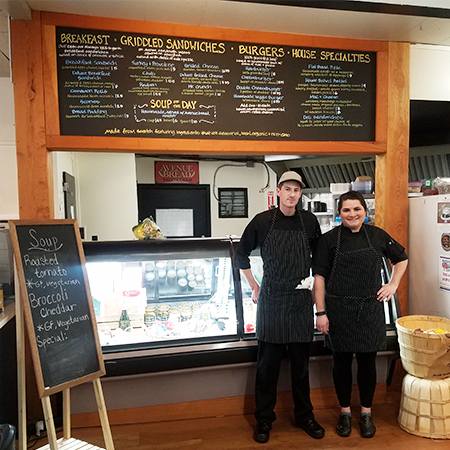 Most recently Noah and Megan have brought on Marshal and Morgan, graduates of the culinary program at Bellingham Technical College, to run the kitchen side of the business. 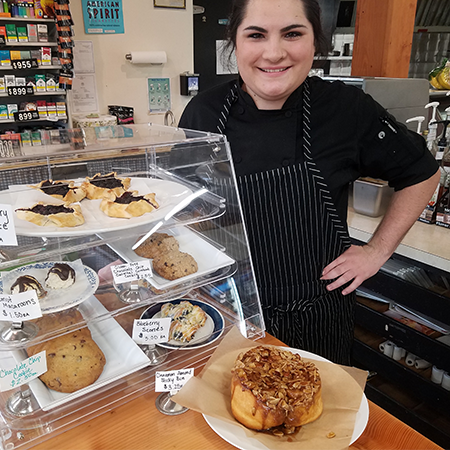 They’ve already made some big changes and have brought incredibly yummy additions to the store, like made from scratch baked goods, pretzels, and flatbread pizzas. 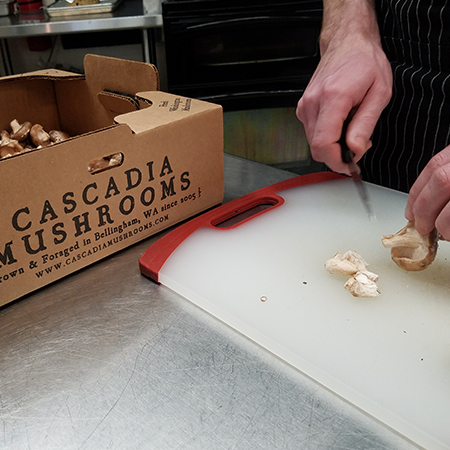 Their passion for good ingredients and locally sourced product is inspiring. They buy from a number of local food and farming businesses including: Avenue Bread, Bee Works Honey, Matheson Farms, Joe’s Garden, Maniac Coffee, Cascadia Mushrooms, Twin Sisters Farmers Market, Cloud Mountain Farm Center, Generation Blueberry Farm, Bender Row Farm, Edaleen Dairy, Ferndale Farmstead, Acme Ice Cream, Pangea Ferments, and Claus Meats. Also, all the local breweries and lots of local wines! 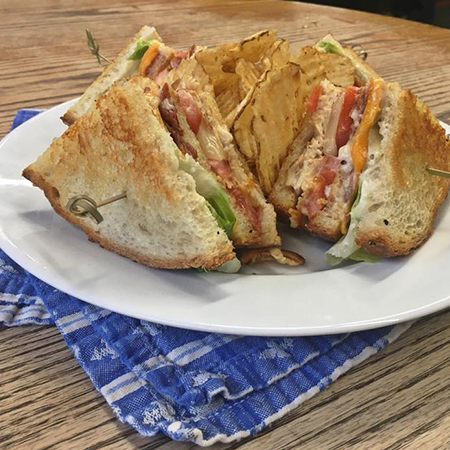 “If there’s one thing you have to try,” Morgan tells me “it’s the Mr. Crunch, a classic French-style sandwich that has a crunchy fried cheese exterior that Marshal added to the menu” (#yummmmm). Marshal actually ran his own small organic farm, having grown up in a family that valued growing and cooking fresh foods. Morgan smiles when she talks about her own childhood memories of cooking–she actually learned to bake because her mom didn’t! She fell in love with learning to create treats so good that people couldn’t help themselves from enjoying. At the Rome Store, Farm to Table doesn’t have to be pretentious and eating out doesn’t have to be a big deal. They’ve had so much love and gratitude from the community that has kept them going during the hard times that every small business has. 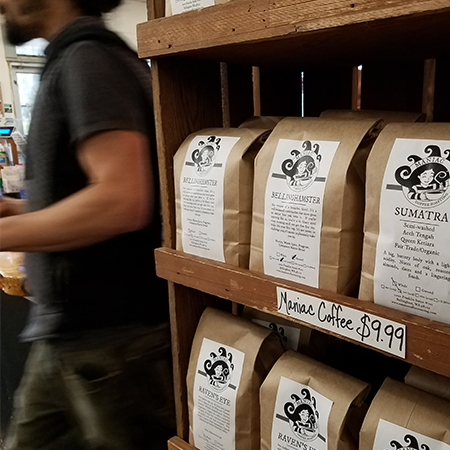 They are a living example of one of the most amazing benefits of owning a small business, and shopping local – we realize that we belong to each other, and that as much as we give – in community – we also receive.